When disasters strike, UNT alumna Sarah Nowery (’05, ’07) responds. 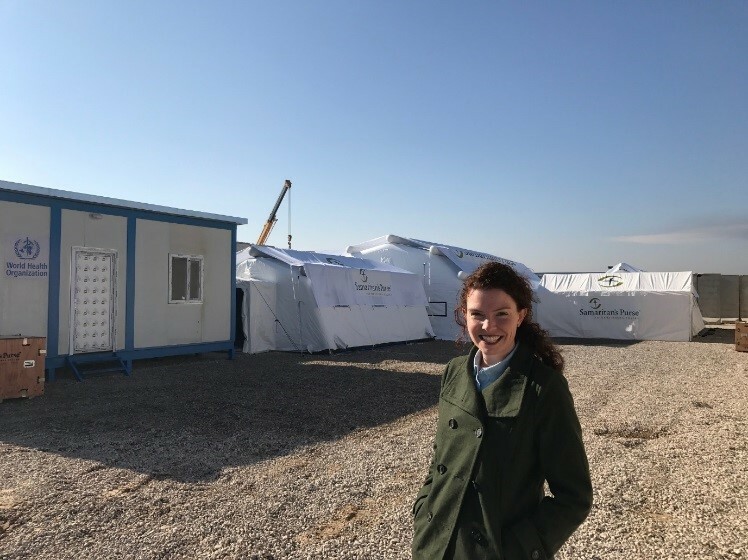 Currently serving as information and communications officer for Samaritan’s Purse – Iraq, Nowery has worked on more than 22 responses to global emergencies resulting from wars, famines, complex crises and natural disasters, and UNT has played a major role in helping to prepare her for a challenging yet rewarding career. Nowery was raised in a military family and lived all over the world but claimed Montana as home. She moved to Texas after high school and was initially interested UNT’s pre-med program but had a change of plans upon discovering another program that piqued her interest. As an undergraduate, Nowery became the first participant of the North Texas in D.C. (NTDC) Internship Program, working as a press assistant for Sen. Kay Bailey Hutchison, the senior senator from Texas. The NTDC Program celebrated its 15th anniversary in April, and Nowery was recognized as “trailblazer” at the event. Knowing that she would need an advanced degree to be competitive in her field, Nowery applied and was accepted to programs at UNT, Syracuse and the University of Denver. However, UNT awarded her a Sumners Scholarship, which afforded her the opportunity to work as a research assistant to faculty who were well respected in the EADP field. Pursuing her MPA with a focus on emergency assistance and disaster relief in the developing world also reaffirmed Nowery’s desire to work in disaster relief and expanded her understanding of the field. After graduation, Nowery began her work with Samaritan’s Purse, where she oversaw the development of the SP disaster response curriculum and training for all SP response staff. Her work took her to major responses in places like Darfur, South Sudan, Ethiopia, Mexico and Ecuador. In 2009, she moved to the Nuba Mountains of Sudan to work with a program responding to the needs of Sudanese who had been heavily oppressed by the northern government. In 2010, she relocated to northern Iraq to establish programs to aid the victims of Saddam Hussein’s Anfal Campaign. Nowery has worked with a team to respond to the massive needs of Iraqis fleeing ISIS and those people further displaced by the response to drive ISIS from Mosul. This response included robust partnerships with WFP, UNICEF and WHO, and saw the deployment of an emergency field hospital to the outskirts of Mosul as Iraqi Security Forces fought to regain control of the city. Though her job can be demanding, Nowery receives support from her husband, Matthew, who also serves as a humanitarian worker in Iraq, and their son and two daughters. She also holds steadfast to her mission of helping others.